I apologize if the page takes a long time to load, this post is heavy with photos. By 7:30 I had put everything away and was ready to roll. With a goodbye wave at my V-Strom neighbors, who were still packing, I left the campsite and headed north on 97. It was a beautiful day, the bluest sky I had seen so far above me, a fresh breeze filtering through the openings in my jacket, it was the perfect riding weather in stark contrast to what I had encountered the previous day. A little later I see this giant on the side of the road and quickly make a stop for a picture. This was not a place where you would expect to see him, it was private property, I had to get on the grass on the front yard and as I approached I saw the warning sign, "Smile your on Camera". Bad English I thought, nevertheless I got the message and after a quick picture I was back on the road. My routine is to usually hit the road early and then an hour later stop for breakfast, when I came upon the Pink Mountain Campsite store it was the perfect time for coffee, unfortunately the food choices were not that great, I ended up having some kind of pastry, good enough to fill the hole in my stomach. The scenery in this part of British Columbia is really beautiful, the undulating and sinuous road is really enjoyable and the best stretch of road so far on my trip. 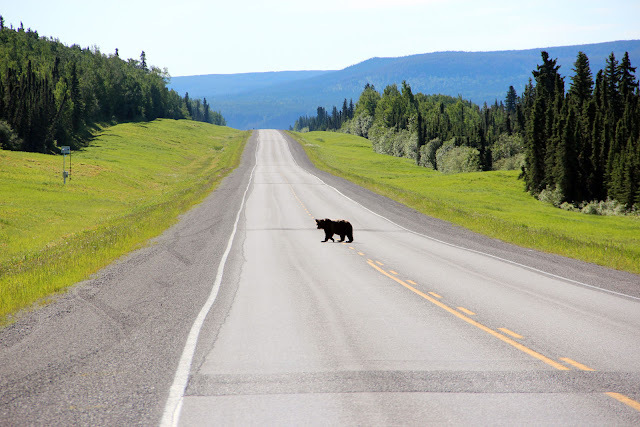 A little latter on a long stretch of road I see two shadows in the distance and as I approach at 80+ mph I realize what they are, two grizzly bears, mother and cub. I was braking as I passed them, my adrenalin shooting sky high, and stopped a few hundred feet later. I look in the mirror and they are still on the grassy area. I leave the bike running and quickly dismount with the camera in my hand, I could hardly contain the excitement, this is what I had been anticipating seeing at any moment and I was all alone. As I stood there trying not to make any noise out of the normal, camera in hand, the mother kept looking at me and slowly started walking towards the road, always looking at me as if to warn me that she was not afraid. She gets to the side of the road and just stood there staring at me. I get the best photo when the cub stands up, looking in the other direction. Yea, you on the Tenere, I see you!!! She starts crossing the road, always looking at me and soon the cub follows her across. Throughout this encounter I was stopped on the side of the road all alone, on the last picture you see a cruiser approaching in the distance, by the time he got to me the bears were on the other side of the road going back into the forest. I couldn't believe I had just had my first encounter with a grizzly and not just one but two. I was later informed that a grizzly cub can stay with the mother up to two years, no wonder the cub was so big. With my heart still racing with excitement I reluctantly put the camera away and continue my journey but soon I had my heart pumping adrenalin throughout my body when I come to my second encounter with wildlife, this time it was a mother moose with two babies following her across the road. I hardly had time to stop and pull out the camera before they disappeared into the forest. I am now entering the Fort Nelson Forest District and encounter the first construction on the Alaska Highway, you can see the loose gravel on the picture, it's quite deep in areas and makes the bike want to wonder a little. I keep my speed up with loose hands on the handle bar, let the bike wonder a little and in softer areas I just ride standing up. I leave a cloud of dust in my trail but since there's no one on the road I'm able to continue at a fast pace. It goes on for a few miles. When I was planning my route and where to stay in Whitehorse, I had come in contact with Paul, aka, "Limey" on the "Yamaha Super Tenere" forum. He had already reserved a motel room in Whitehorse and was looking for someone to share the cost, I was looking to do the same and so it was, we would stay together. 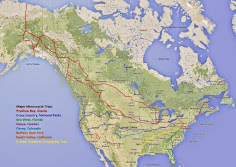 At one time we had planned on meeting north of Toronto, he lives in Canada, and ride together but he was able to leave earlier than me and so we planned on meeting in Whitehorse or on the road. 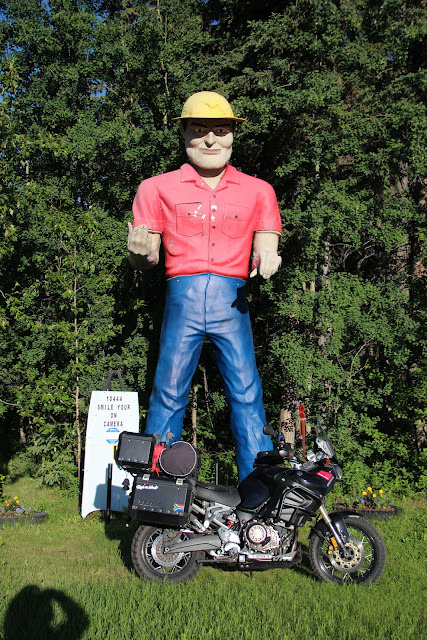 A few days earlier I had received an e-mail from Paul's wife saying he was on the road with two other riders he had met on the way and they were approaching Dawson Creek. I had been following his "SPOT" tracker and knew he was ahead of me, I was catching up to him though, but on a road that goes on forever and with so many different areas to stop, the chances of me running into him were slim. A little later I'm passing a gas station and out of the corner of my eye I see two Tenere's and some other bike. Tenere's heading north must be going to the event in Whitehorse, I hit the breaks and quickly make a U-turn. As I approach the bikers one guy says, are you George? I reply "are you Paul?" I wonder what would be the odds of us running into each other on the road, I had passed so many other riders. Pretty soon we were back on the road, three Tenere's and a Yamaha FZ1. Paul had been traveling with Pete and John, they were on the way to Alaska but not to the event. Soon thereafter we arrive in Fort Nelson. The town lies east of the Northern Rocky Mountains in the Peace River region, directly along the Alaska Highway at mile 300. Wiki here. I stop for the obligatory picture and then we make a stop for gas and refreshments in town. We continue north passing various riders coming in the opposite direction and at the next stop run into a young man in his twenties, riding a Suzuki GS400S from the early 80's. He's from the Seattle area and is on the way to Dawson City. We chat for a while, admiring his bike and luggage and then leave, this would not be the last time "he" would run into us. His name is Jean Paul, I think that's how you spell it. A few miles down the road we run into construction again and this time we have to wait for the lady to let us go. There's a Harley Davidson already waiting, I stop next to him and find out it might take a while before we can proceed, time for pictures. As I'm taking pictures a familiar GS400 arrives, it reminds me of the Tortoise and the Hare fable. He's last in line. The Harley guy looks at my bike and tells me to go ahead, he continues with "you guys with the adventure bikes can travel must faster than me", I totally agree and take off followed by the other two Tenere's and the FZ1. The Harley and the GS fall way behind, I'm starting to like these gravel roads. I ride on the left lane to take a picture of my friend and then quickly dispatch of him as I pick up speed. With construction over we quickly get back to speed, not that we had slowed down much. We enjoy the scenery and the still beautifully blue sky. We are stopped to take pictures and replenish our bodies with water on the side of a gorge when we hear the sound of the GS400 coming up the road. Jean Paul travels much slower than us but still catches up to us. He pulls out the one gallon ice tea container and I'm thinking he's going to drink from it but then I see him opening the gas cap and for a second I thought he was refueling with "Ice Tea" but then realize that's his gas container, why didn't I think of that, it's way cheaper than my Rotopax. We all laugh at the casual attitude Jean Paul has, he's seems like a really nice young man. Soon we are riding next to Muncho Lake, really beautiful and rocky scenery and that's when I see the mountain goats for the first time. They are very difficult to see in this type of rocky terrain. Can you see the second one? This part of British Columbia is stunning, the rocky mountains and the sinuous roads offer beautiful riding conditions. I have so many pictures, these were taken while riding. I'm really enjoying this trip and today was the nicest day so far but I have to stop here and break it into two posts, I'm afraid this might tax Google's servers....just kidding. Great pics. Great to see a young guy exploringthe world on bike. I would of been crapping myself with the beers, but hey what is a little adrenlin occasionally. Apparently his parents gave him some money and told him to go see the world but I don't think it was a lot as you will see. George, great pictures. That must have been an awesome ride! I'll have to put that on my list of places to go. Thanks Erik, you have to do it, there are amazing roads up north. The photos are great. You have fabulous scenery which would be hard to take a bad photo in. Mental note: Put this highway on the bucket list. Definitely have to put it in the bucket list, you won't regret it. Yea, that's the problem, you take your eyes off the road and you can get in trouble pretty fast. You will see later what happened to a trucker I ran into on the way back. I have to say my two favorite photos are the first one where you can see the road ahead and where you've been in the mirror and one of the shots where you can see your eye and part of the helmet. For some reason I find that shot striking. Maybe because you are so focused. Excellent adventure - isn't it great running into new people ... grizzlies and moose, that's some serious wildlife, am certain I wouldn't have taken my hands off the the handle bars to take a picture. Except they might want to eat you. Love the dirt roads. Great wildlife encounters. I'm not sure which is scarier, bears or moose. I would keep the motor running and not leave the bike! But would probably drop the bike if the wildlife started walking my way! !